I try. Every day I try. I will lay out the little diva's clothes for her. Sometimes she would deign to put on what we've picked out for her. Other times, she takes one look and says, "No!" She just turned two and already she wants to pick out her own clothes. Now, accessories. 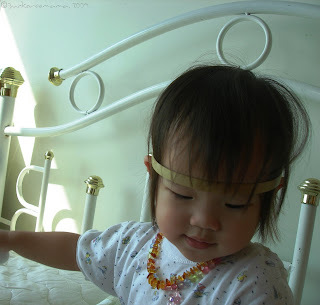 Beyond the amber teething necklace that she (always) wears, Zoë hasn't shown any interest at all in hair clips, head bands, bracelets or other little baubles. Until now. 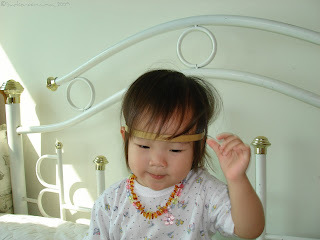 Okay, we thought she looked rather cute, like a little Pocahontas. BUT this is not one of those "outfits" where I could just shrug and say, "Whatever" and let her walk out the door looking like that, wearing what she's wearing. This is so totally not staged, believe me. 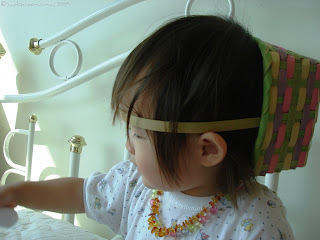 Because I am not crazy imaginative enough to think of using the handle of an Easter basket as a head band / tiara! Zoë wore it like that for a bit, then she got tired of the look and wanted to try to wear it in different way... and got stuck! Muffled cries of "Help, Mommy. Stuck!" came from inside the basket. Chris and I were laughing so hard when we were trying to help her get unstuck. With this little diva, every day, there are moments like these. HILARIOUS!!!! I was thinking awww... its okay you could take her out with that "headband" on - until you showed the back - still laughing!!!!!!!! She is a cutie! Oh my god! Laughing out loud at the kitchen table. That makes me think. When my brother, sister, and I were little, we played that we were elves. 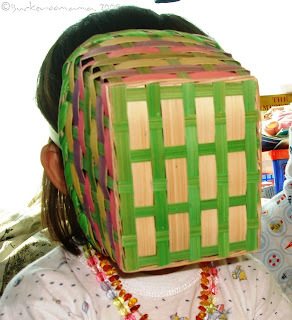 We put plastic sand buckets on our heads and said they were our communicating devices. However we couldn't hear anything, given that we had buckets falling down over our ears. So we had to yell in elf speak to eachother. My brother and sister both graduated from Harvard and have Ph.D's. You had better start saving for college like now:). Ok, I'm laughing my head off. That is way too cute! Diva indeed! lol! That's genius. I love that you stopped long enough to snap the picture while it was over her face - I would've done the same thing! That is way too funny, love it!!!! That is just too funny! 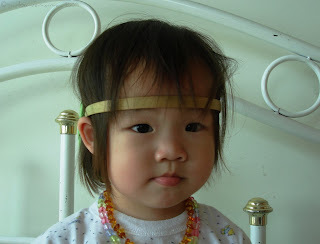 Love that Easter basket headband idea! Very cute! Mine was very opinionated at that age as well and I have darling pictures with the Easter basket on the head as well - to cute!! That is hilarious!!! I was thinking, hm not so bad, until I saw the back view. Heehee. What a cutie pie. Girls do love to accessorize! Tee hee! It's ALL about the accessories! Too cute!! My daughter started having her own opinion about clothes at about 22 months!! Somedays she wants a dress or polka dots with stripe pants,and some days she tells me -"I don't want to wear anything pretty!" They are so funny- and exhausting sometimes. I laughed so hard when I realized that tiara was a basket on your daughters head!! Haha, hilarious. Like everyone else, I thought it wasn't bad. Until I saw the basket hahahahaha! But hey, a few years down the road it might be a fashion statement. Haha.